On Monday, the starkly polarized Supreme Court is expected to rule on an abortion case that could greatly disrupt access to abortion in Texas and beyond. Although Whole Woman's Health v. Hellerstedt concerns a 2013 Texas law, reproductive rights activists have warned that the high court's ruling could affect similar laws in other states where abortion rights have been rolled back under the leadership of right-wing legislators. In Texas alone, the omnibus 2013 law, if upheld, will impact at least 1 million women, as well as increase the burden on already-overworked abortion providers; at worse, it may pressure more and more Texas women into turning to illegal medication and harmful self-abortion practices. Whole Woman's Health v. Hellerstedt has been billed as the biggest abortion rights case since Planned Parenthood v. Casey, the 1992 case that allowed states to pass their own restrictions on abortion unless the laws placed an "undue burden" on patients, thus creating the undue burden test that has become standard. 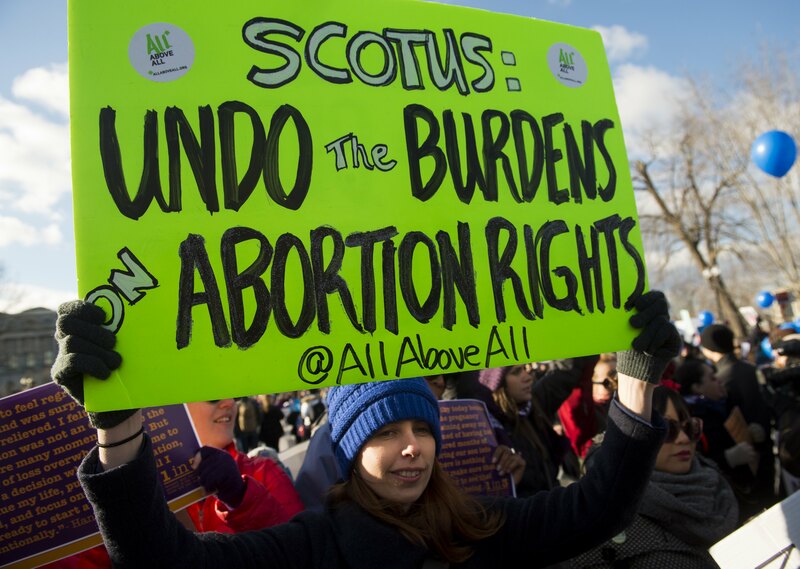 Undue burden is now at the heart of Whole Woman's Health v. Hellerstedt, with Justice Ruth Bader Ginsburg reminding her fellow justices and Texas officials that the state must remember "the burdened women" — not the women who will still be able to obtain a lawful abortion. Here's a breakdown of the plaintiffs, lawyers, provisions and arguments at the center of Whole Woman's Health v. Hellerstedt. The lead petitioner in the case is Whole Woman's Health, an abortion provider network that operates clinics in Texas, New Mexico, Maryland, Minnesota and Illinois. Amy Hagstrom Miller founded Whole Woman's Health in 2003, and considers the network more than just abortion clinics; the website states that it's a "feminist organization," and the network's principles and advocacy work certainly push for an inclusive framework that attempts to overcome politics. In 2015, Hagstrom Miller and Whole Woman's Health founded Shift, a nonprofit that works to "shift the stigma around abortion" in American culture. Hagstrom Miller is not the only petitioner in the case. The Center for Reproductive Rights filed a petition in September 2015 on behalf of four Texas clinics in addition to Whole Woman's Health: Austin Women’s Health Center, Killeen Women’s Health Center, Nova Health Systems and Reproductive Services. Three physicians were also part of the lawsuit: Sherwood C. Lynn, M.D. ; Pamela J. Richter, D.O. ; and Lendol L. Davis, M.D. The Center for Reproductive Rights has been handling all the legal proceedings, using 37-year-old Stephanie Toti, a long-time Center employee, as its lead attorney. This was Toti's first time arguing a case before the Supreme Court, and the Center for Reproductive Rights made sure she felt supported by starting the hashtag #StephanieHasAPosse, which went viral during oral arguments on March 2. Planned Parenthood Federation of America, the American College of Obstetricians and Gynecologists, the ACLU, Physicians for Reproductive Health, American Public Health Association and Jane's Due Process were among the organizations who filed an amicus brief with the court. Over 110 women in the legal profession also filed an amicus brief detailing their personal abortion stories. On the Texas side of things, Texas Solicitor General Scott A. Keller handled the oral arguments on behalf of the state's health department. Texas had support from numerous "right to life" organizations, the United States Conference of Catholic Bishops, Priests for Life, Live Action and women who say they've been "injured" by abortion. So, what's this scary abortion law, anyway? In July 2013, the Texas legislature passed HB2, an omnibus bill that featured several new restrictions on abortion: 1) all physicians who provide abortions must have admitting privileges at a hospital within a 30-mile radius; 2) all abortions — whether at 6 weeks or 16 weeks of pregnancy — must be performed in an ambulatory surgical center (essentially an outpatient surgical center); 3) medication-induced abortions cannot be administered through video-conferencing (telemedicine); and 4) abortions after 20 weeks post-fertilization (so really 22 weeks of pregnancy) are banned except for few circumstances. The liberal justices also questioned why a relatively low-risk procedure — first-trimester abortion — was being subjected to greater medical regulations and extreme practices than procedures with higher complication risks. Justice Stephen Breyer wondered why these new restrictions were even necessary — was Texas creating a problem that never existed? Probably. Just two of the HB2 provisions were challenged before the Supreme Court, but they're the two provisions that have the most impact on Texas women: the admitting privileges and ambulatory surgical center requirements. When enacted in 2013, the admitting privileges requirement shuttered roughly 20 clinics, leaving Texas with just 22 clinics, according to Fund Texas Choice. In 2014, the ambulatory surgical center provision left Texas with just eight clinics. Then, after the 5th Circuit Court of Appeals ruling upholding the entirety of HB2 in 2015, abortion access in Texas was nearly wiped out again; just nine clinics remained open. When the Supreme Court stepped in, blocking the the 5th Circuit ruling, about 10 more clinics were able to re-open. As you can see, the regulations of HB2 have been pretty good at turning off the lights at clinics from El Paso to McAllen to Dallas. As Kagan pointed out during oral arguments, the last two years provided Texas with a sort of "controlled experiment," proving how HB2 will shutter abortion clinics from town to town, doctor to doctor. An estimated 10 clinics will be left operating if the Supreme Court upholds the entirety of HB2 — that is, the ambulatory surgical center requirement and the admitting privileges requirement. That's 10 clinics to service the entire state of Texas, which is the second-most populous state in the nation. With the exception of the Whole Woman's Health center in McAllen, located in South Texas near the Mexico border, all of the last remaining clinics will be in major cities: Austin, Dallas, Houston and San Antonio. For women who live outside those areas, the amount of travel to an abortion clinic is sure to increase. According to the Center for Reproductive Rights, 1 million Texas women will live at least 150 miles from a licensed abortion clinic — and that's 150 miles one way. Now combine that with having to travel to a clinic four times: once for an ultrasound and in-person counseling; twice to take the abortion pill on a gurney in a surgical arena; and one more for a check-up. Four times, 1,200 miles. As Ginsburg told Keller, you can't ignore the burdened women. But what's more troublesome for reproductive rights advocates and physicians is that Texas and HB2 could easily become the norm for the majority of American women. There's also concern that the distance, which drives up the overall cost of abortion and increases the waiting time before a procedure, will lead women to look for cheaper, more convenient yet potentially dangerous alternatives. "Today we stood up for the woman from Lubbock who will drive over 250 miles one way to end her pregnancy," Hagstrom Miller said on the steps of the Supreme Court after the oral arguments concluded on March 2. "We stood up for the mom from Laredo who will look through her cabinets, hoping to find something that will end her own pregnancy because she can’t afford the travel, the child care or the multiple days off work that have become part of getting an abortion in Texas." Following the death of Justice Antonin Scalia, who was vehemently opposed to abortion rights, there are two likely outcomes in this case: a surprising 5-3 decision or a split 4-4 decision. The Center for Reproductive Rights, Hagstrom Miller et al are looking to avoid a split decision, which would automatically uphold the 5th Circuit ruling that endorsed the constitutionality of HB2. If HB2 is struck down, there's a chance the ruling could nullify similar admitting privileges and ambulatory surgical center laws in other states. Abortion rights supporters are hoping Justice Anthony Kennedy, who was vocal throughout oral arguments but seemed a bit unconvinced, will swing to the side of the four liberal justices. The problem with Kennedy, however, is that he's never been a vanguard for reproductive rights (remember: he sided with the conservatives on Hobby Lobby, a move that outraged his BFF RBG). Abortion rights have never been his thing. There is a strong possibility that Kennedy will send this case back to Texas and the 5th Circuit, so the state can research more supplemental evidence about the capacity of the remaining abortion clinics to take on an uncertain number of new patients. Lyle Deniston, writing for the SCOTUSblog, explained: "It was Kennedy who raised the possibility that the case be sent back to lower courts to allow lawyers to put in evidence about that capacity question. [This] would allow the Court to avoid a decision about the validity of either part of the Texas law." It wouldn't be the victory that Whole Woman's Health, abortion providers and Texas women were looking for; in fact, it would be a simple delay tactic for the Supreme Court. However, it also wouldn't be the crushing defeat that would roll back decades of abortion rights and inspire states with similar laws and even fewer clinics.